Newcastle is a City full of culture and creatives, and the shopping is amazing. Aside from the usual high street chains there are lots of smaller independent boutiques and studios, you just need to know where to look. One such boutique, Love Niche, is hidden away on Clayton Street in a second floor studio. Offering a bespoke styling and made to measure service, Love Niche also stocks hard to find brands and one off pieces for when you absolutely must have something unique for a special occasion. In-house Designer and studio owner Nisha Vedhara designs her own range which she stocks in store too. Specialising in Cruise / Resort wear and Occasion wear, each piece is unique and hand embellished, the work that goes into creating each piece is immense and demand is high as her loyal clients keep coming back for more. Despite having known Nisha for some time now and having become firm friends, today is my first visit to the studio and I’m looking forward to it. Why? Two words: Sample Sale. 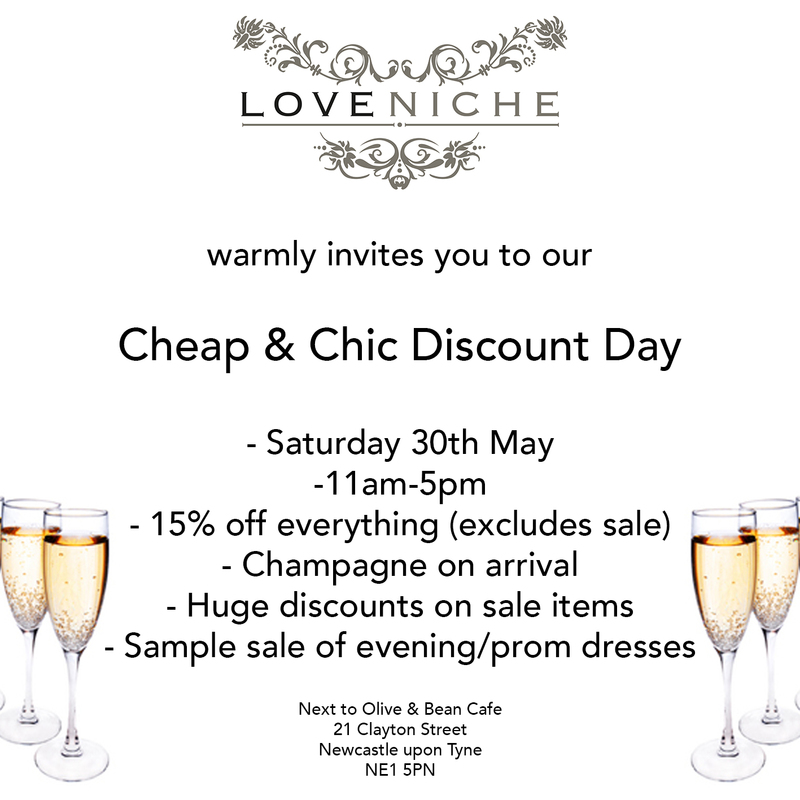 Love niche has thrown open its doors to reward clients past and present and entice in new shoppers with a 15% discount off all full price items, as well as some real knockout prices on sample and one off pieces. You may remember that I was invited to attend a Love Niche Fashion Event back in April where Nisha showcased her entire new season collection so I’ve come here today with a mental shopping list…. As you enter from the street and make your way up the narrow staircase, framed images of the collection line the walls. The studio is well equipped, there’s a large reception area where champagne and canapés are being served and in the main viewing area, the collection is displayed in themes around the room. It’s like a huge closet, with a jewellery island in the centre which sparkles in the sunlight. It’s busy but very relaxed and everyone is advising each other on which items to try on, I spot some familiar faces; there are a few high profile models, a young ballerina and a well known Popstar and her family in the studio today and all have armfuls of clothes. Nisha’s own Love Niche Resort wear is by far the most vibrant of the collections, with bold colours and prints dancing amongst the rails, it’s the area of the studio commanding the most attention. Nisha greets every guest warmly and makes sure everyone has a drink, she’s buzzing about giving advice to guests on how to style items, or what type of shoes to wear with a particular item when I arrive and she comes straight over to say “Hi”. I’m instructed to “think outside the box” Nisha knows me well enough to know that I’m pretty unconventional in the way I put an outfit together, I try on a super long pleated skirt which is soooo not my usual style and I’m talked into buying it (very well actually) by Clare, a fellow guest and the sister of Faye Tozer of Steps fame (Clare, you should be on commission). I spot an amazing Chanel-esque tweed longline blazer, and an Indian paisley shirt dress which I decide are coming home with me too. I beg Nisha to sell me a bowler hat and a jewelled twenties style crown which are part of a display and not actually for sale and she agrees. (Lucky bonus). I swear I was only in the studio for half an hour but according to my watch it was actually more like two and a half hours and judging by the bag of goodies I brought home with me, that kinda makes sense. 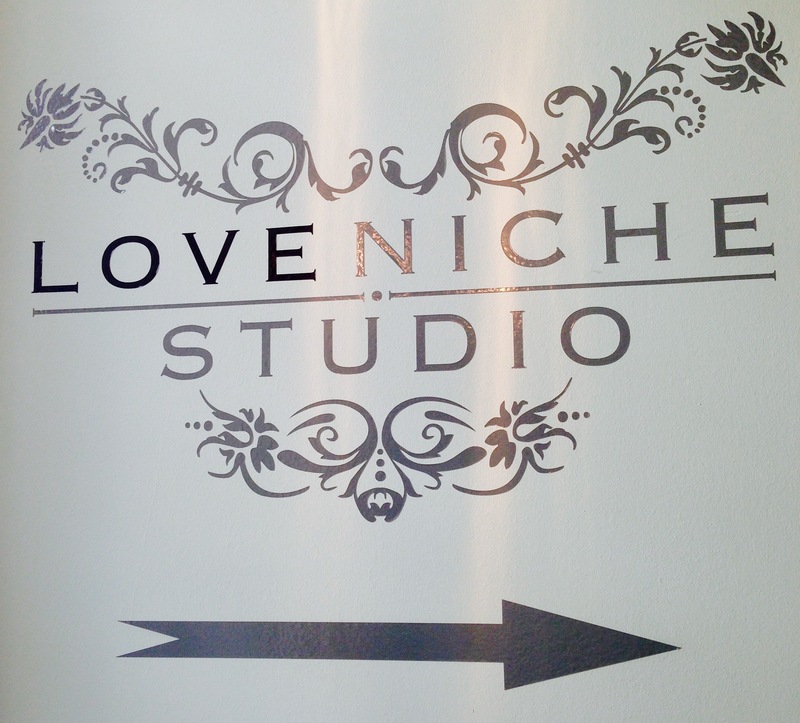 So, If you’re in Newcastle and are bored of the high street, give Love Niche a visit, you might just be surprised – it’s a non-judgmental environment and there’s something for every budget and every body shape. Just don’t get too attached to the display pieces, they’re not actually for sale….